1. Pour some glue on your cone and spread it around with a craft stick (you don't have to cover the cone all at once, you can just do sections at a time). 2. 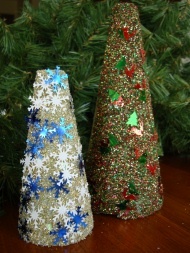 There are two options for putting on the glitter: You can sprinkle it over the glue and shake off the excess, OR, you can pour the glitter in a paper plate or on wax paper and roll your cone in it. Reuse your glitter by putting the leftovers back in the container. 3. Glue on your Christmas confetti or sequins all over your glitter tree. There's quite a bit of Glue on your cone, let it dry for quite a while! You can find styrofoam cones at your local craft store or discount department store for $2-$6 depending on the size. We used loose glitter, you can use glitter glue, but it won't give the same effect; There is much less glitter in glitter glue. Another, although more expensive, decorating option is using small beads to decorate your tree, be creative!